I’m proud to partner with Stonyfield Organics this year. As always all opinions are my own. I’m so excited about today’s post. I’ve been doing the whole salad in a jar thing for a few years now. I will prep a few at the beginning of the week and then I can grab and go. Whether it’s a play date or a busy day at my house and no time to make lunch. I even empty these onto salad plates for dinner some nights. Shhh don’t tell my husband that. The beautiful thing about a salad in a jar is that all of the contents of the salad including the salad dressing are in the jar. My friends at Stonyfield have partnered with Ball Canning Jars to bring you some tasty recipes this month. 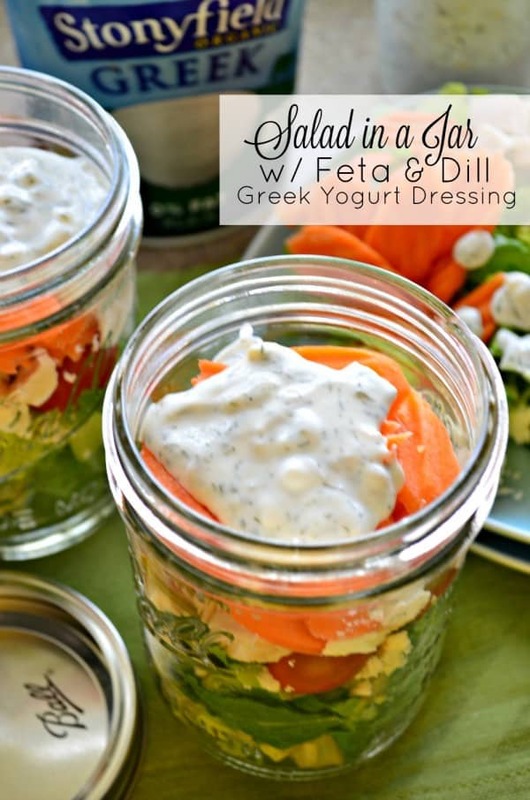 Of course I had to share my favorite homemade recipe for Feta and Dill Greek Yogurt dressing and a quick salad recipe to go in the Ball Canning Jar. The key to making sure that your lettuce is not soggy is to make multiple barriers and layer other ingredients. You’ll want the hardest ingredient at the top of the jar. In my case I almost always use sliced carrots. You can make a nice little barrier. For this salad I layered the salad first, then the peporicini (I dried it off good before adding it to the jar), followed by the chopped cooked rotisserie chicken, a little bit of crumbled feta cheese, grape tomatoes, and then the carrots. Then I poured the salad dressing on top. I closed the jar and then flipped over the jar. This way I know that the dressing will stay on the bottom. Typically my salads will stay super fresh in the refrigerator for 3-4 days although most of the time I’ve consumed them for both lunch and dinner before the 3/4 day mark. 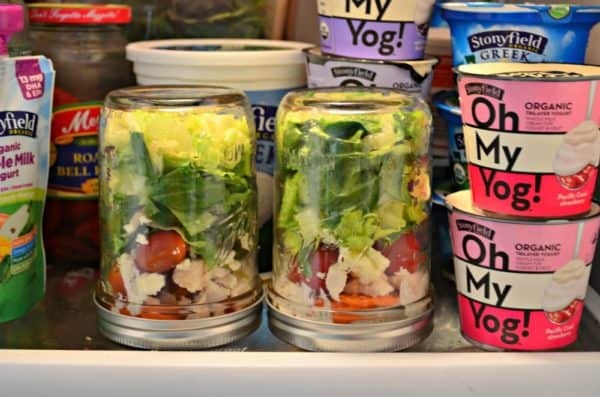 So if your up for trying to simplify your life a little more I invite you to buy a package of Ball Canning Jars and Stonyfield yogurt and try my recipe for Salad in a Jar with Feta and Dill Greek Yogurt Dressing. In a Ball Canning Jar (or salad dressing container) combine all the salad dressing ingredients. Mix well until all the ingredients are combined. Seal tight and place in refrigerator until ready to add to salads. For the salad in a jar: Divide the chopped romaine lettuce between the four Wide Mouth Ball Canning Jars. Then add in 1 peporicini to each jar, followed by grape tomatoes (divided immediately), crumbled feta and cooked rotisserie chicken. 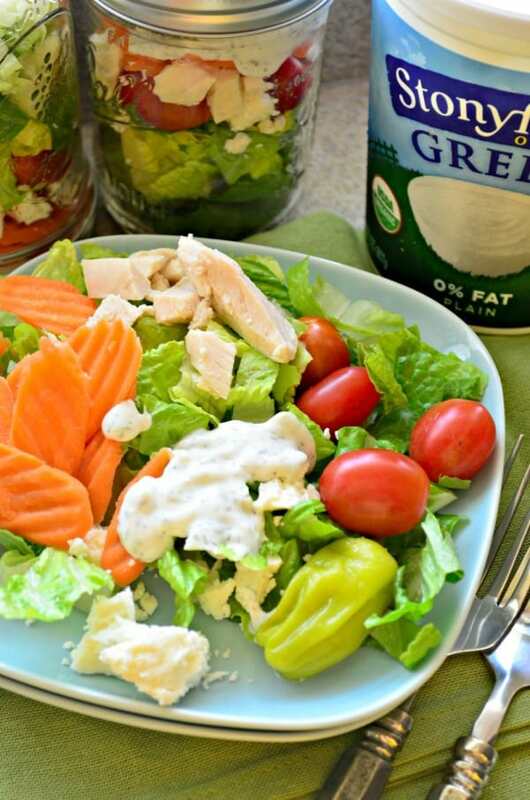 Then make a barrier between the salad and the lid with the sliced carrots. Lastly, pour salad dressing on top. Seal the lid tightly and flip over the salad dressing is on the bottom of the lid. Store for up to 2 days in the refrigerator. 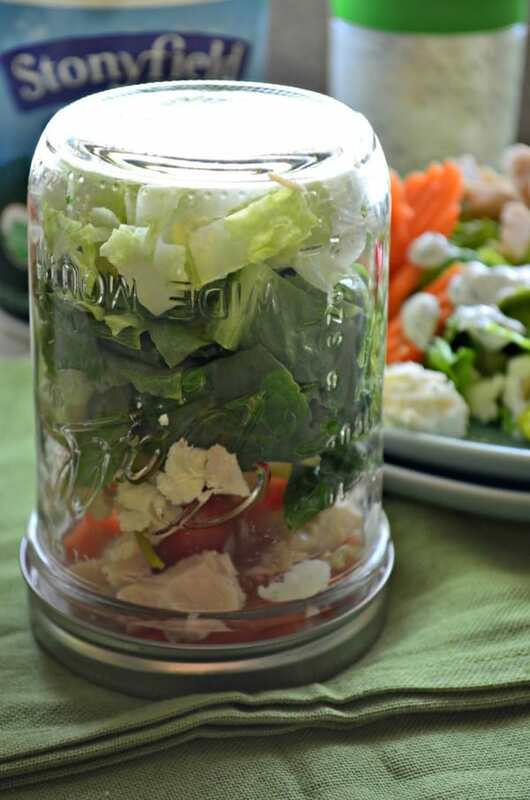 Once your ready to eat, you can either pour the salad onto a plate or shake the Ball Canning Jar so that the dressing evenly disperses throughout the salad and then enjoy inside the Ball Canning Jar.